Package Includes: 2 x Ultimate TS-100 Air Powered Tripod Speaker Stand. Air-Powered Series speaker stands from Ultimate Support represent everything all other speaker stands aspire to be. 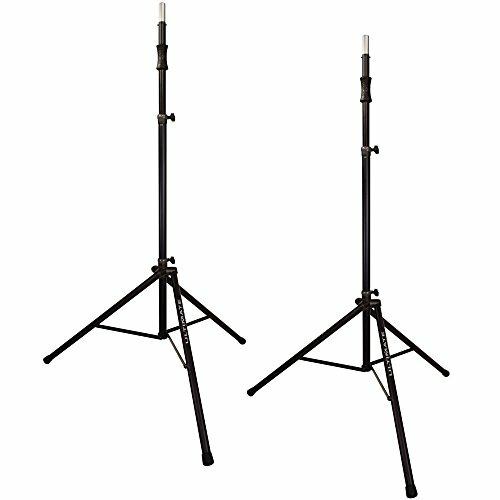 They're incredibly strong, extraordinarily sturdy, lightweight, 100% field serviceable, AND raise and lower speaker stands on their own! Driven by innovation and years of research and development, the Air-Powered Series feature an internal shock that lifts speakers weighing 50 lbs and less with no effort, and requires just one hand's worth of effort to raise speakers weighing more than 50 lbs! There are three models to choose from: the TS-100B, TS-110B which offers additional height, and the TS-110BL which also offers additional height plus a leveling leg that allows the speaker stand to stay level on risers, stairs, and other uneven surfaces.